I took a Mediterranean cruise last summer – and this article highlights my journey. Before I describe the trip in more detail, here are some basics: our cruise was run by a one-ship cruise company, called Voyages to Antiquity, on their Maltese-registered vessel: The Aegean Odyssey. Our cruise itinerary was called “God Created the Kornati Islands”. Destinations were chosen for their importance in ancient times, many being UNESCO-designated sites. For anyone who likes a small-ship cruising experience, there is a lot to love about this kind of cruise vacation; I’ve tried to capture some key elements. 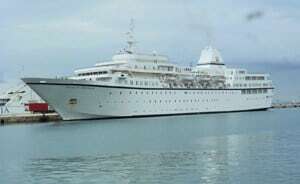 Size – Aegean Odyssey holds 350 passengers at full capacity but often carries less as there are several solo travelers. 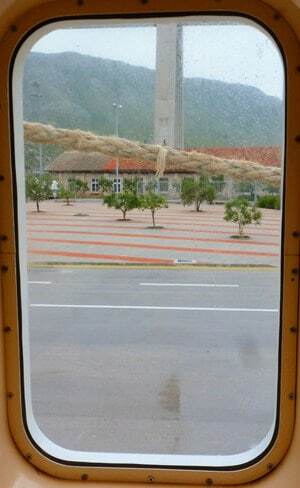 On our May, 2012 sailing, there were about 270 passengers on board. 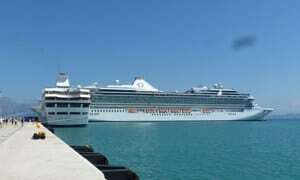 In my photo to the left, the Aegean Odyssey is perpendicular to Oceania Cruises’ vessel, Riviera. This comparatively large ship holds 1,250 passengers at full capacity (though is still not large compared to others holding 3,000 to 5,000 people). Virtually all cruisers onboard Aegean Odyssey were English-speaking; the majority were from the UK, then Australia, followed by US and Canada – with a few other nationalities represented. Crew – Our Captain was Greek but the majority of the 180 people making up the Aegean Odyssey’s crew hail from the Philippines and Indonesia. All of the staff – from Reception to Cabin to Bar/Dining and everywhere else one cared to go was exceptional – most making a point to learn each passenger’s name from day one. The lecturers and entertainers did their jobs very well, and the staff maintaining the ship kept everything spick and span. Plus, we arrived everywhere safely, on time, and without any unpleasant incidents. All in all, the crew were top-notch. 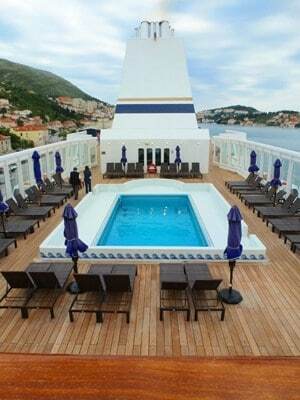 Amenities – The Aegean Odyssey’s facilities are simple but quite pleasant. Common rooms are not large but they are immaculate, bright, and contemporary in design. There is just one sit-down dining room and one buffet dining area. There is no casino or photographer and no night club acts – things I easily can do without. other common facilities. Having everything on a much smaller scale than the monster ships was a big plus for me. Unfortunately, there is no Wi-Fi available in cabins and there are only a couple of hubs. But, the good news is that internet access in the computer room costs far less than on large ships (only $6/hour). Musical entertainment on our cruise came mainly from two small groups playing in the ship’s Charleston Lounge. First, a marvelous Romanian trio called “Café Concerto” (piano/accordion, violin, base) who are broadly talented and supply both classical and modern music daily (repertoire ranges from “Vivaldi” to “The Twist”). We also heard from Cadence Duo, who play – either together or separately – contemporary music including a number of show tunes. Onboard entertainers also do some separate concert-type shows in the Auditorium. To round out the experience, a large group of local entertainers were brought onboard during our overnight anchorage in Dubrovnik. In addition to the musical entertainment, movies are also shown either in the Auditorium (or in-cabin) and many are linked to destinations, such as “Zorba”, “Mama Mia”, etc.